For Mother’s Day weekend , we went for biking and hiking near Lake Habeeb, a wonderful place near Cumberland, MD. On Sunday, Mother’s Day, we missed breakfast at the hotel (not our fault but don’t get me started). At the time we were very upset but it turned out to be a mixed blessing because we discovered Bob Evans. Bob Evans is a chain of diner style restaurants that we don’t have in Philadelphia. They have the best breakfast dishes and the famous Bob Evans sausage. They say Bob Evans got so frustrated with the poor quality sausage in the market that he decided to make his own to make things right. Last weekend, I literally ran into Bob Evans sausage in a local supermarket and got some although I had no idea what I’d do with it. But as I was staring at it, I remembered the mental note that I’d made when I saw My Little Expat Kitchen’s amazing ‘saganaki’. I made it with different sausage and much less oriental overall but I owe her the inspiration for the dish and, oh boy, was it good! How to make: Heat the butter and cook the sausage. Save the cooked sausage in a plate. Add the tomato slices and let them cook. 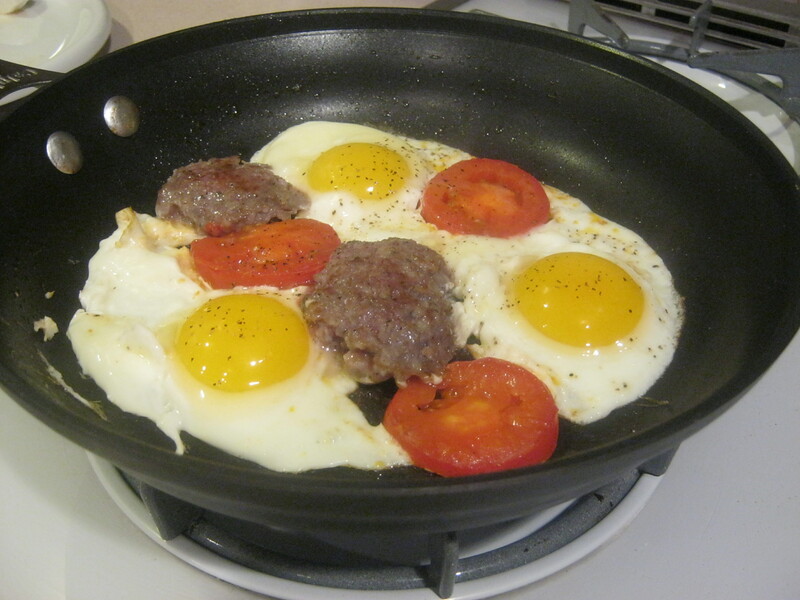 Crack three eggs and add the sausage. 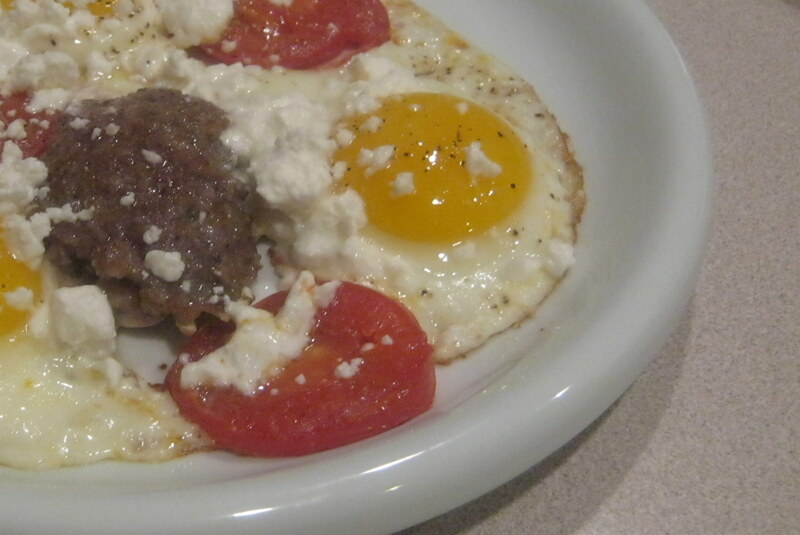 Tiny bit salt, depending on the saltness of the sausage and the feta cheese, and pepper. Let the ‘saganaki’ cook at low heat until the eggs settle. Sprinkle with feta cheese crumbles and serve. Good job! It’s the same dish with a different sausage. Some ouzo on the side and it’s perfect . Fantastic dish! I called it less oriental because the sausage was milder and I didn’t use bukovo that would make it too spicy for the kids. Thank you so much for sharing the recipe. I have made more “mental notes” from your blog but haven’t had the chance yet. Some of your desserts, also, are beyond! Oh yes, boukovo would be way too hot for kids. Thanks for the shout-out Eleni. Thank you, Melina! I’m glad you like them. Hug.